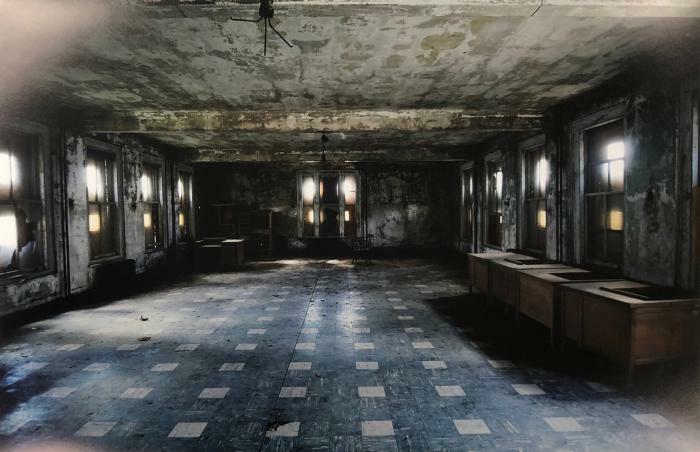 Colored photograph of the interior of a building with blue floors and a damaged ceiling. Furniture pushed up against the walls. They endured twenty nine seconds of hell to determine whether they had made it to freedom. Those that failed were brought to large wards to be with those who had similar illnesses. If the health officials deemed it necessary they would separate husbands, wives, sisters and brothers from one another as well. Imagine sitting in a crowded room filled with unfamiliar faces and being treated as another number within the cesspool of germs, sweat and tears. Wondering if they would ever see their family again and mustering all kinds of emotion.